8.61 points at 23 votes (rank 17). 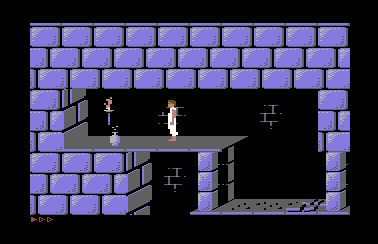 The well known game Prince of Persia (the follow up to Karateka, 1984) by Jordan Mechner was converted for the C64 by Andreas Varga (aka Mr. SID) and published on 16 October 2011. It is based on the original Apple II code from 1989. Same as with the forerunner, the exact animation of the characters movement catches the eye, but this was the first time that human movements were displayed rather realistically with the help of rotoscoping. This game runs on a real C64/128 only with the help of the EasyFlash cartridge. 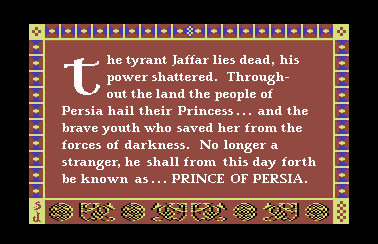 Now you start in the role of the future (hopefully...) prince in the dungeon and have 60 minutes real time to work your way in the palace through dangers, traps and guards, collect items, fight against the vizier, defeat him and finally embosom the princess. This is not easy, as some obstacles and combinations of obstacles are hard to take. Interesting surprises await thereby the future prince or respectively the player! 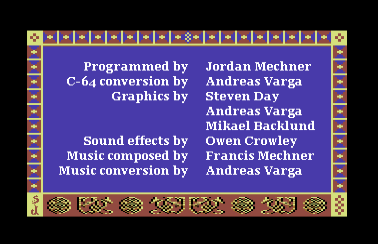 The C64 conversion comprises all 13 levels. The conversion is successful. The game speed is high, the controls precise and easy to learn. Graphics and sound also give a good impression. During the game there is no background music. The used sound effects as the moving noises, the important opening and closing sounds of the gratings, fighting noises or the sounds when traps appear are enough to underline the game and to create tension. 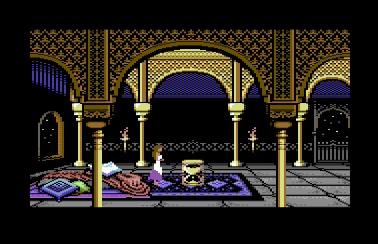 If the aim of a level is reached, the screen flickers and a short oriental music sequence is played. The animated characters are a bit pixellated, but appear very smooth due to the good animation. The graphics gets a 3D -view due to its type of display. The seldom appearing "stuttering" on the C64 was further reduced at the C128 by using the 2,04 MHz storage cycle. Also, there are animated intermediate sequences underlined with music, that continue the story. These relieve the stress of the game and reduce the tension the has been built during playing. The manual is integrated in the game and can be chosen at the beginning by a menu. The score can be saved from level 3 on the EasyFlash cartridge. The movement of the prince is normally very fast. In some situations it is necessary to act slower. By pressing the fire button at the same time with the keys for the movement this was made possible. Furthermore one can pick up items or drink from them, hold onto ridges and let oneself fall down slower with the fire button. Search everything on the screen. There are amongst others also loose boards which you can make fall down by jumping around.Furthermore there are switching boards to open and close gratings and doors. In some situations you have to slip quickly through the iron gates. Try this also with narrow passages! At the start of the game you have 3 power points. You lose one point by falling too deep (2 storeys), by boards that fall on you and by a hit in a fight. Big red energy potion: all power points reloaded plus 1 additional power point. It makes sense to collect many big energy drinks, as the fights need more power and the difficulties get greater in the higher levels! Traps and also some fighters get only active when you get close to them! Traps or also guards (outside the fighting mode), as well as falls over 3 storeys can kill you directly. If you die within the real playing time, you restart the current level anew. But you need to press the fire button within 20 seconds after the death to repeat the current level, or else the game is ended and you go back to the title screen. CTRL + G = You can save the current game starting from level 3 on the EasyFlash. CTRL + L = loads a saved game (during the title sequence). 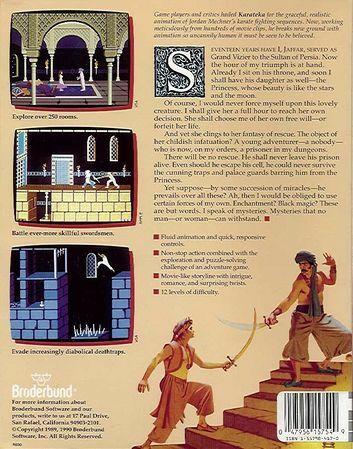 Level 1: Search the sword (left side of the dungeon) and leave the dungeon on the right side. Before that you have to fight against 1 guard! Level 2: Use the exit on the right side. Here you have to fight more and therefore there are more energy potions to fill up the life display. 1 extra life. Level 3: At first open the iron gate at the upper left and then slip quickly through the gate (left). Save point. Defeat the indestructible fighting skeleton. The entrance is at the left. 1 extra life. Level 7: Hold on tight at the start of the level and then reach the floating potion, the be able to reach the lower exit door of the level. 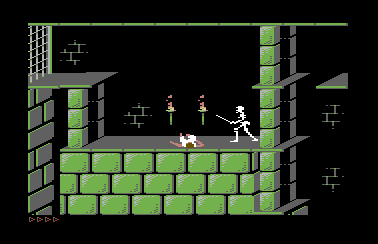 Jodigi: "If is fun to play the C64 conversion. Concerning the strategy it is as tricky and finicky as the one on the PC". H.T.W: "What a year for me!! 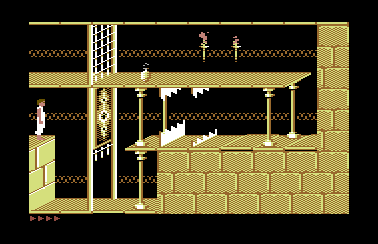 Knight 'n' Grail, Jim Slim and now also Prince of Persia, Mr Sid has whipped up one of the most ingenious conversions for the C64! You mostly wander about in deep dark vaults with their floors and passages consisting of platforms and fragile wall panels, for which you need a filed jumping technique to cross them. 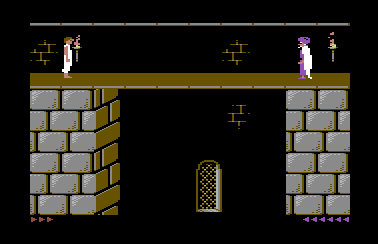 But not only the simple Jump'n'Run fascinates, but even more the climbing passages that our agile prince has to master and the possibility to open and close different dungeon doors with the help of hidden pushable boards. 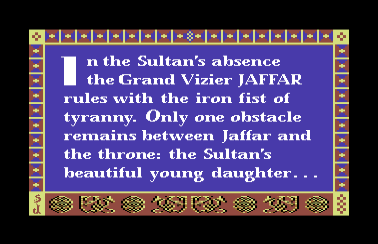 The appendant labyrinth-like level system which is well thought-through can exasperate you, without maps the princess will probably wait in vain for her liberator. Also various potions, that enhance your health but also sometimes turn out to be poisonous, can be found. After you have found the sword, you have to save your skin with the classic fencing style. 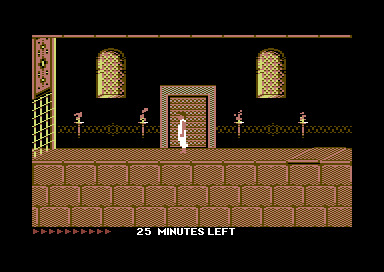 The single levels need to be crossed fast, as our hero has only 60 real minutes time. The many mean traps in the shape of darting spearheads, razor-sharp iron panels or also loose brickwork that crumbles away below your feet, provide a high difficulty level. Nevertheless, you will go about the levels again and again and master them afters some practice. Finally, it can be said that the conversion has lost nothing of the flair of the original by John Mechner and can be described as overall well-done. Absolutely recommendable, from me the full points! Colt: "One of my favourite games from back then[tm] on my favourite computer from back then[tm], finally, after all those years! Looks good, sounds good and plays fantastic, an "official" version could have hardly been better. At least 10 points, alone for the fact, that somebody has not only started this huge project in his free time, but also finished it." 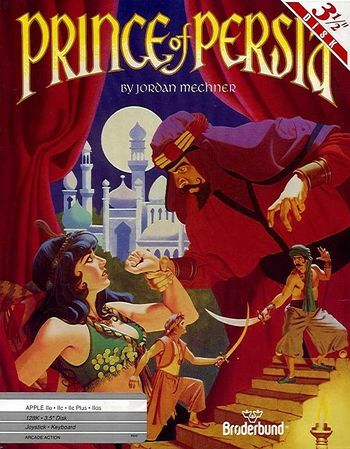 According to Jordan Mechner, there was never an official C64 version created, as no software company was interested in a C64 version in 1989 (when he programmed the Apple II version), because the system was seen as too old. But this could have only looked like it from the US American view, as the C64 had not reached the same level of importance in the USA as in Europe. Because in Europe the game was published also for several 8-bit home computers and consoles such as Amstrad/Schneider CPC, Nintendo Game Boy and NES, SEGA Game Gear, Master System, ZX Spectrum and SAM Coupé. But all these machines never reached the same diffusion rate as the C64. The Apple II original required 128 kilobytes of RAM and the unofficial C64 conversion requires EasyFlash due to it using the cartridge as both a storage medium and an extension of RAM. 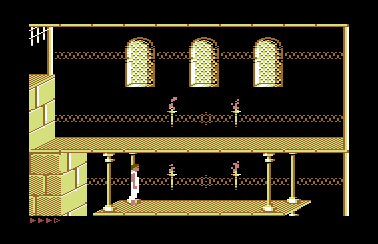 According to the developer of the C64 version he couldn't have finished the project without EasyFlash, since the regular RAM memory of C64 was simply insufficient to produce accurate conversion. This issue with the available amount of memory may have been a major obstacle for official version at the time. There is no own cover for the C64 version at the moment, therefore the cover of the Apple II version is displayed here. This page was last modified on 15 January 2016, at 03:22. This page has been accessed 15,637 times.